This blog was originally published by Intellus Worldwide in their Young Professional Journal, Spring 2018. Healthcare continues to be at the forefront of innovation, the political agenda, and a hot topic everyday life of the average American. Making up 18% of our GDP spend, healthcare dominates the national headlines from a social, financial, and technological perspective. As my time as a young professional comes to a close, I look back at the last nine years of my healthcare market research career and am in awe as to how far we have come. In an era when we pride ourselves on being the most developed nation in the world, and set the gold standard for care, we clearly still have a lot of work to do. In fact, a recent study from the popular economics blog, Carpe Diem, found that healthcare costs in the United States have risen approximately 125% since 1997 while inflation has only jumped 56%, meaning the average person now pays more than twice as much for the same care. Something has to give, right? American history shows that when entrepreneurial spirt meets access to capital, longstanding challenges begin to find solutions. Enter Apple, Amazon, Berkshire, JP Morgan and CVS who are disrupting and reshaping traditional healthcare – creating new opportunities. That’s where we come in. As young professionals, we have a once in a lifetime opportunity to make a distinct mark during a critical inflection point in our industry. Patients can now receive medical advice through video conferencing or download a Doctor on Demand App; physicians can write prescriptions from their mobile device or track a flu outbreak via Google Flu Trends. To keep up, we too must play in the digital age. 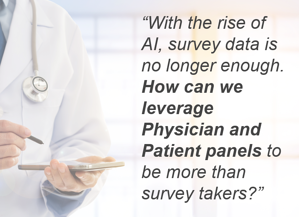 Automation must be part of healthcare insights if we plan to have a seat at the table and deliver timely results that drive meaningful business decisions. Platform as a Service (PaaS) must be accepted by research companies and client-side-researchers as an intersection of research and technology. Your best developer will be just as important as your best salesperson or best researcher. Mobile technologies must be embraced as the norm, not the nice-to-have. Fewer and fewer physicians are engaging in survey taking, and rightfully so. We have continuously provided 60 minutes Patient Record Form surveys that none of us would wish on our worst enemies, and yet we continue to research this way. Short, simple, engaging surveys can often yield better insights with richer data sets. Mobile Apps, Social Surveys, and creative opportunities must be on the table and finally, respondents must be challenged to think instead of answering the same boring questions over and over.